The following is a transcription of an audio tape recorded by Neville Mitchell, relating his memories of the Meadowbank Factory, the last of three Automatic Totalisators Limited factories, including photographs Neville has supplied. Neville was a long serving employee of Automatic Totalisators Limited and has held several management positions with the company. When I first joined the company, I think he was the manager of the drawing office. There was always a handful of employees in the factory who were not associated with the operations department, who realised the importance of successful operations, this being the primary gauge of the quality of the company's product. They would assist wherever possible despite the fact that it was not their responsibility to do so, often donating their own time, sometimes on week ends or late at night, to achieve this assistance. They realised that operations was the proverbial coalface of the company and this often made my life and no doubt others in operations, out in the field, easier. Neville was one of these people. If you wonder why he has included a description of a hand washing basin, you may cast the blame this way. It was something that struck me as unusual and somewhat opulent for a working factory. I asked Neville if he remembered it. Before progressing to Neville's descriptions, following is a Trove Newspaper Archive article relating to the acquisition of the land this factory stood on. A swamp area fronting the Parramatta River at Meadowbank, drained and improved by Ryde Council, has been sold to Automatic Totalisators Ltd. The price paid by the company for the 8½ acres was £2,592, compared with £800 paid by the council for the land several years ago. The town clerk, Mr. F. C. Taylor, said yesterday that Automatic Totalisators Ltd. intended to build a modern factory on the land for precision engineering and tool and gauge manufacture, and to beautify the foreshores in the area. This tape is a collection of thoughts on the setup of Automatic Totalisators. I first joined the tote in May 1962 and retired from AWA in October 1994. I have 32 years of tote experience mainly in the projects side of tote or in the design and development and in the later stages in the manufacturing area. Whilst studying industrial electronics, I bought a transistor radio from a sailor at the Ship Inn at Circular Quay Sydney, it cost 10 pounds. I took it to a lecture and we took it apart. The instructor told us that transistors were a novelty and would never take on. Author's note - I also recall these sort of predictions being made. As we all now know the electronics industry did transition to using semiconductors in preference to valves (tubes) wherever possible. One of the main reasons for this is illustrated in this photograph which shows the miniaturisation possible by comparing a valve (tube) with a semiconductor equivalent. It could alternatively be said that solid state components replaced thermionic emission components. This photograph is not one of Neville's collection but one of many donated by Frank Matthews, the last senior partner of George Julius' engineering consulting company Julius Poole and Gibson. When I joined Automatic Totalisators I had never heard of totalizators or horse racing as such, it was always one of those things that never entered my mind. My initial start was in the organ department. Believe it or not we made electronic organs which were sold mainly to churches because the tonal qualities of the organ were aimed at the pipe organ and it fitted in there nicely. That did not last long. It was not returning huge profit and in those days tote was very profit oriented and it wasn't very long before the organ department was sold off to someone else. I decided I liked the place and from then on I moved into the tote operation. I was amazed when I started with Automatic Totalisators, the building was so impressive. The organisation was impressive and there was a lot of very impressive people involved in the place. The first thing that struck you was the cleanliness, the building was sparkling. You could walk around the machine shop in bare feet and you wouldn't tread in machine swarf nor would you get grease or oil on you. The organisation of the place stemmed from most of the people having served in the forces during world war 2, so they brought with them the disciplines of the Navy, the Air Force and the Army. Most of the guys leading the place such as foremen, production managers and the like which I had contact with initially, were very very strict. You had to be in the right place at the right time and you had to have the right piece of paper accompanying the work that you were doing. Everything was run by bells and whistles, there was a clock on system and a bell that went to start work and a bell that said it was morning tea and a bell that said it was lunch and a bell that said it was afternoon tea and the one in the afternoon which was the knock off bell which resulted in pandemonium. At peak times when we would have something like between 250 to 280 women working in the wiring department alone, who all wanted to get home, it was a stampede for the doors and the bundy clocks to clock off. Getting back to the building. The building was designed for Sir George Julius in 1947 by a company he was involved in called Julius Poole and Gibson. They had already designed several other buildings around at that time, one was the lifesaver building in Marrs Rd. Lane Cove and another one was built for a margarine company over in Gardners Rd Mascot. The buildings were very similar they had that Art Deco rounded sort of technique about them. The plans were applied to the land Julius had bought from a family called Faraday. Faraday had bought the land from a bloke named Parkes who had been granted the land back in 1800 I think it was. Some 72 parcels of land were surveyed by Arthur Philip and his crew because they could row up the river and they could see these lands there and that is where it was called Meadowbank because it was flat and it had been previously burned out and cleared by the aboriginal population and it wasn't long before these people called Parkes moved onto the land and developed farming and particularly orchards. At the time Julius bought the land there was a small orchard about where the factory was built. There was no road in front of the land, there was no Nancarrow avenue, that was developed as part of the Julius setup. The building material shortage prevalent after the war particularly bricks was a problem. Julius had done a deal with the Northern brick company up in Thornleigh and he got bricks ahead of schedule. I was told by the Agent who sold up the Nancarrow Avenue factory site that originally there were 72 lots of riverside land owned by Sir Henry Parkes. I had seen a plan of the land adjacent to the river when the new tool room was being built it showed how the many plots were aligned facing the river and Bowden street to the west and Constitution Road to the north Nancarrow avenue was dotted in as a laneway. Bob Tombs who was born and bred in Meadowbank, recalls that there was an orchard on the factory site, Ron Hood also referred to this orchard as he too lived as a small boy nearby. Raiding the fruit trees was a local pass time. Our current political set up could do with a few Parkes' to sort out the mess we are in now. I had no idea that the "bloke named Parkes" Neville referred to in his audio recording and appears in his paragraph above, was Sir Henry Parkes! Sir Henry Parkes has been called the Father of Federation in Australia. It is ironic that Sir George Julius who built his factory on this land has been called a Nation Builder. Thinking about it now, it also seems ironic that a family named Faraday later owned this land, as the factory built on the land would eventually be designing and manufacturing electronic equipment and Michael Faraday has been called the Father Of Electronics. The building consisted of two sections, the main factory section, the factory warehousing, office and executive suite there was then a gap of some 40 feet, then there was an auxiliary building which contained the canteen for the staff on the top floor and the staff dressing rooms locker rooms shower rooms which for those days was very up market. The canteen had a kitchen which could produce at least a thousand meals a day. The locker rooms were extensive and contained everything that the worker would need. There was sufficient hot water, in the roof there was a 2000 gallon hot water system. There was a large toilet arrangement, one of the unique features about that was a 2 metre diameter Terrazzo wash basin which was a round affair and it stood about a metre high and in the centre was a chromed pedestal with many faucets or gargoyles coming out of it and to operate it you put your foot on a circular rail which passed around underneath this pedestal and water squirted out all around and there were soap dispensers on gimbals so you could wash your hands and it only took one guy to put his foot on the bar and the water would come out in all directions. You could imagine ten or twelve men washing their hands at any one time around this Terrazzo device. Its history was that the manager of totes at the time Alf Boa liked to spend a lot of time in the States particularly in the early days when they were trying to set up Atusa (later Autotote). Webmaster's note: Alf was General Manager of Automatic Totalisators Limited. The problem with Atusa (later Autotote) was getting government approval for a company outside of America setting up business in America but they finally found a loophole in what was called the Sherman Act, an anti monopoly act and that allowed them to start the business up. However Alf had a suite in the Waldorf Astoria where he had seen this wash basin affair in the public men's room. It so impressed him he ordered one and had it shipped to Australia where it was duly installed in the men's locker room on the first floor of the annex block. The annex block ground floor was a service arrangement where you had such places as the packing department where all the crates and boxes were made for shipping the equipment around the country and overseas. There was a fully outfitted and maintained medical centre which had a full time nursing sister usually of matron level. A visiting doctor came every Monday Wednesday and Friday where the staff were able to attend the doctor free of charge and you got your prescriptions which were delivered to Meadowbank and your medicines were provided free of charge, all backed up by the company. The Automatic Totalisators Limited First Aid Room. Tucked away under the staircase leading to the staff canteen was the First Aid rooms, one room was fitted out as a casualty area with a high bed and all the supplies to treat an immobile patient. An open area immediately after the double entrance doors was the general attendance and minor injury treatment area. Matron Teresa Hill was in charge of all things medical to do with the staff, always dressed in a Red Cross style nurse's uniform and head dress, she was a delightful person to have attended to your splinter or cut finger, get a headache powder or advice on medical matters. On a weekly basis a Doctor Darcy Crowle attended the first aid room where he was available for consultations. Dr Crowle was an imposing man ex WW2 service in the Middle East. He would prescribe medicines for his patients, Sister Hill would have the prescriptions couriered to the local chemist, later the prescriptions were returned to her for distribution to the patients. All this was free of charge. Sister Hill was also responsible for all of the staff who travelled overseas, to ensure all their vaccinations were up to date and their Yellow Health Card, that was attached to passports, was duly authorised with Sister Hill's and Dr Crowle's signatures. These vaccinations were painful and you often ended up with scabby sores. I for one always cringed when I saw Sister Hill at my office door, waving a kidney shaped white enamel dish, loaded with a dreaded large nickel plated syringe and my yellow card. The first aid room operated during the normal day shift, the night shifts were covered by staff that had St Johns Ambulance certificates. Sister hills vacation times were covered by her friend Sister Margo Bolton, she too was a lovely person, and nothing was a problem to her. Margo a tall distinguished woman was also an accomplished artist. In later life her oil paintings were exhibited at Sunshine Coast Art Galleries. The First Aid Room was just one of the benefits of working for Automatic Totalisators Limited. The generally excellent working conditions and the very type of work, kept many people dedicated to the company and its success in the supply of world class unique equipment, for all their working lives. The printing department was also down there. In the early days they had three Alexander type printers which were all manual, the whole business of running the paper rolls was done from Jumbo rolls and splitting and then printing on single rolls and then on one machine they had advanced to having twin rolls. This was labour intensive, noisy and dirty. In later days this was replaced by a Galhus 160 automated printing machine which took most of the labour out and it would print in the vicinity of a 1000 rolls per hour in up to three colours. Further along the building was the maintenance department where a number of men worked on the maintenance of the building. There was the plumber the electrician, the painter the permanent carpenter and then there were labourers who tended the gardens and things like that. Further along there were two garages that provided housing for the managers car and probably the chairman of the board. At that stage there was only a handful of company cars one a 1960 Chevrolet and the rest were FE Holden sedans and one Holden utility and one Holden panel van. There was many other vehicles involved but they were mainly for the Totemobile Bus or Truck arrangement and they were rarely seen at the factory anyway. Further along in the annex building was the switch room where all of the power for the factory was distributed along overhead bus cables. Further along from that was the gas measuring and metering and safety area and to finish off that building there was a store for volatile liquids etcetera. This was a good combination, electricity and gas with lots of thinners and the like all in the one area but it never caused us any problem. Also in the garage were 2 340 KVA Gardner diesel auxiliary power supply systems, which could supply some power, not enough to run the whole business, but enough to keep the factory running during times of blackout and power shortages. They were used many times over the years. We had a very bad experience with them. At the time I was in charge of them. They had warning that the power would be off for some time whilst the electricity people upgraded our substation. We got to work early and run the two diesels up, we synchronised them and switched over to auxiliary power having warned most of the people especially those with computers not to run them and that it would only be a few hours and that they should turn off their monitors but the smarties decided that they wouldn't do that. Anyway everything was going fine, we checked the loading we checked the frequency was holding well we were well within bounds. Then I got back to my office and I noticed a flicker, that was all it was, just a flicker and I did not take any notice and the next thing there was no power bang! I quickly went back to the generator room and the production manager was having a fit. What had happened is one of the generators had broken a governor. The governor had forced the diesel into full power, maximum revs which had sent the synchronising system mad and suddenly instead of having 415 Volts running through the system we had what I estimate about 660 which did wonderful things for the fluorescent lights and VDUs and everything else sitting on those lines was melted or fused and all told it cost us about $2000, all for a piece of steel rod with a thread on each end that had decided to come undone. As soon as you came in to the front door of the main building, you would see the swirling staircase, heading to the second floor, the glass ware, the windows, the partitioning, all reflected the architecture of 1940. Upstairs in the executive suite it was all done in maple walls about 3M high then plaster ceilings. Downstairs the drawing office area was quite spartan in their architecture but very functional. The factory area was next to the office area separated by a large long corridor which was supposed to be an isolation to keep the dust dirt and noise away from the executives. The main factory was a sawtooth construction, a concrete floor which was smoothed over with a yellow ochre coloured cement which was very finely finished and this could be easily kept very clean. The machine area was the same all the way through with each machine properly positioned with reasonable light, however very little attention was paid to noise. On the far eastern end of the building was the tool room which was actually a separate operation to the rest of the plant because a lot of the work they did was external to the requirements of Automatic Totalisators. They had a very good reputation in the industry and at one stage it was the largest, best equipped toolroom in the Southern Hemisphere. It was run by a red haired bloke<!- Milton Jervis> who ran the place with a fist of iron. As it turned out, his men were men every one of them because they matured and either stayed in the tool room or left to do other work in the industry. All were very successful mainly because of the strictness and the way he applied his "do it right the first time" attitude. They were very inventive and very advanced in tool design in the early days of injection moulding and hard plastics such as the bakelites and ureas, and when the soft plastics came in such as PVC and vinyls they were certainly leading the market and they produced many moulds and dies for consumer products in Australia. They were also very involved in the production of equipment for the telecommunications industry working for TEC, Plessey STC and those sort of companies which were producing at that stage electro mechanical telephone equipment. They had some very advanced machinery. A lot of it was provided by government grants because in the early days of the 1950s and 1960s the government still provided money for industry to have machinery which could be very easily shifted to defence operation. Hence we had machines which would otherwise never be able to be afforded in normal industry such as the Societe Geneoise jig boring machines which came out of Switzerland which even in those days would exceed 250,000 dollars for the one machine. They were beautiful machines and had to be kept in rooms with 1 degree tolerance and humidity control and their accuracy was phenomenal. The toolroom was later shifted from the main plant to the new toolroom plant which was specifically built in 1975 in what was the car park area of the company on the other side of Nancarrow Avenue. It was just at the time when the Asian toolroom capacity was starting to be realised as quicker, cheaper and the Automatic Totalisators toolroom started to decline. The back of the factory which backed onto Constitution Road was levelled off. Some sheds were there and they were used first off for the Blacksmith because he was noisy and dirty. He also did some of the small castings in bronze. Those base metal castings in the blacksmiths shop and some of those sections were beaten by hand in the old fashioned way. Also there was a paint shop out in the back as well. On the Western end of the factory was the assembly department for the ticket issuing machines and adders which were the main products when I went there and in the centre was the manufacturing area where machines of all types were manned and operated to produce all of the components for the ticket issuing machines or adders. If you looked at a J8 or a J6 or an A class adder or a C class adder you quickly realised that there was practically no external componentry that was brought in direct, the exceptions being motors and multi digit counters and the like. 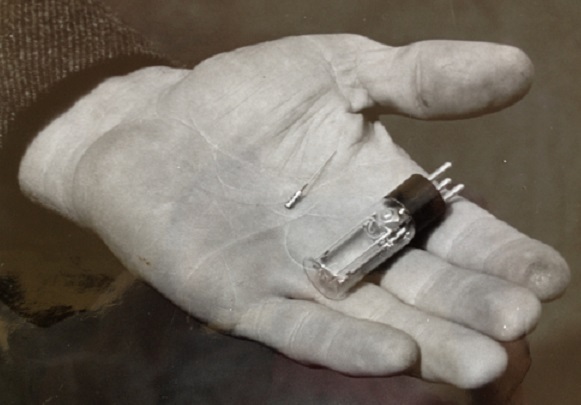 Everything else was manufactured, the switch packs, the relays, the whole bit was designed, developed and fitted in the Automatic Totalisators organisation. Of course to control all this they needed a very strict operational system starting from the design and development and prototyping of the machines or modifications and alterations to the machines which was at that stage just starting to be carried out at Meadowbank. Prior to that it had all been done in Julius' city office where he would issue drawings to the production shop or to the toolroom where the prototype would be put together and then the testing was done by Julius himself in most cases. The system of quality control was rigid and it involved 100 percent inspection of everything. This was done in the first stages of raw material, then it went through processes until the item was issued into stock and then issued back out to production for assembly. This was controlled by a fairly extensive system of inspections. The inspection department was outfitted with very precise measuring equipment. They even had a small air conditioned room where these measurements and testing procedures were carried out. At that stage they had a National Measuring Laboratories Certificate and the guys who worked in there were all licensed as they could test to Defence or Aeronautical specifications. When the goods were assembled and ready for testing, test procedures were in place, often there was a test piece of equipment provided which was often called "love box". You could plug a J8 into one of these or a single shaft or multi shaft adder and it would put it through its paces often doing cycling run-ins and all that sort of thing. Each piece of equipment was paper-worked through, it was a very early attempt at MRP2. In those days for anything to be remarked on, that something got into the field that was faulty, was very very rare indeed. A lot of the problems which were recorded were more a design problem than a manufacturing fault. In the Julius electro mechanical totalisator there was always three solenoids or trip relay device. The series circuit created by the scanner, to the ticket machine's demand for a bet, included firstly the OVERLAP Relay (OLR) in the distributor, then the TRIP COIL solenoid in the Ticket Machine, finally the (GT) trip solenoid in the Grand Total Adder. As the current in the series circuit rose to one amp, the solenoids release almost simultaneously, thus completing and recording the bet. The setting of the one amp trip current, was tuned accurately by use of the ATL "Love Box" test set, comprising a ammeter and a cranking handle, so the optimum setting could be tested at speed. The later mini totes, such as the COUNTER Totes, had specially designed SEDCO rotary digital counters, with a solenoid wound to act similarly to the OLR and GT solenoids. All the counters in a Counter tote were identical. The stores in the building were extensive. They carried spare parts for everything. It was no problem to have a spare part for an adder that was built in 1917. It would be part numbered and there would be a store of them somewhere. This system carried on all the way through, there were bits and pieces of every product that was ever made especially the consumable spares were kept and it was a source of profit all the way along. The stores were manually managed in those days with a bin card system and it was fairly late in the day when that went on to an MRP electronic computer arrangement. I was at one stage involved in the inspection department for a few months. They amazed me because of the equipment they used. The best measuring device was an AVO8, the only oscilloscope was a very early model dual trace Marconi which was probably good to 100K and that would have been it and it used to break down a lot. There was a few other things like high voltage testing equipment, a Megger and a few other measuring devices such as DC volt meters and the like. Then there was mechanical measuring equipment like micrometers, vernier callipers and they were pretty good stuff, the electrical stuff was a bit on the mundane side. The wiring department when I first went there was run by a lady foreman<!- Gloria Murphy>, ex army and she controlled the girls with a rod of iron and they produced beautiful work, I never saw wiring quite like that apart from some of the Telecom jobs I had seen prior to coming to Tote. Every girl worked from a route sheet, she did not know what she was doing, she was just given a diagram and she put a wire between this point and that point and ticked it off and kept on going. They wired those relay sets, lamp box controllers and all that sort of stuff from method sheets. The wiring department used to fluctuate greatly in numbers. When a project came on they would build up. Most of these were housewives who wanted a job for a while, came in did a project and then went off again. There was a general level of about 70 girls till late in the piece when it drifted down to practically none because all of the work was now printed circuit board and required very little hand wiring. There was all sorts of problems associated with that many women in the place. There was cat fights of course, the usual office and factory affairs that went on and there was always some scandal running somewhere, it kept the place interesting. The factory had a very active social club. They played cricket and tennis and they arranged Christmas trees and Santa Clauses and that sort of thing for the kids and employees. It was very well run and very well attended by the staff and factory personnel. In 1963 I was invited by the engineering department to join them in a project which was then called MMRC which was the upgrading of the 4 Melbourne race tracks and to go into engineering and assist them with design, development and drawing of that new system which was two large mobile trucks with 24 win place adders and indicator systems. I moved to an upstairs office where I had Don Hardy as my direct boss and Peter Rolls and Terry McAuley were the engineers and I did their bidding. This was the first time that I came across the Automatic Totalisators drawing office and it was run by Alf Lessons an Estonian gentleman and assisted by a Russian gentleman I think his name was Talus Backmanus. It was also the first time I came across an Isis drawing machine. All of the drawing I had done up till then was during my studies on a T square and Triangle trick and all of a sudden I had this Isis which was one of those parallelographic balance machines, the biggest one in the factory at the time because some of those drawings we had to do for the MMRC project were quite large. They took up all of the board and as I discovered, the Isis was highly inaccurate so that if you started in the bottom left hand corner, by the time you got up to the top right hand corner you were running a bit off square. The drawing office was a paper organisation. There was no modern equipment at all. The draughtsmen had Isis parallelograph machines. 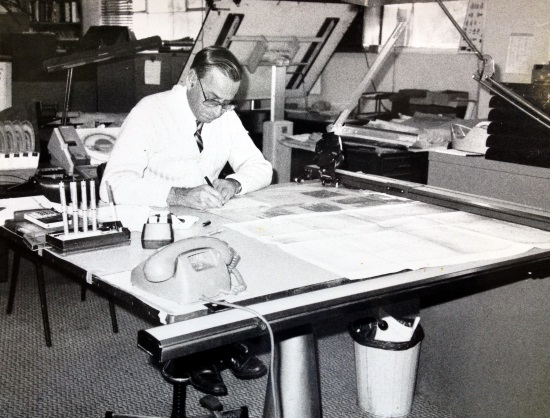 The drawing standards were very high and the concept of design control and drawing number control was conceived by Julius himself and over all the years, I never saw anything as good as it, even with the modern computerised numbering systems they used on CAD CAM systems now, it was far better. It took hardly any time for an outsider to come to terms with the way Julius wanted his drawings to run. 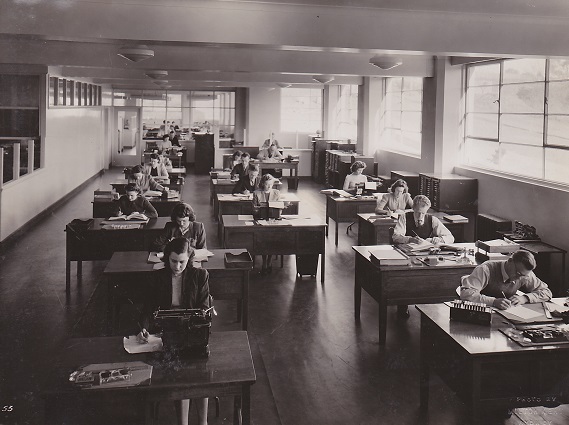 The office was spartan, there was a polished wooden floor and at that stage some of the bearers had failed and it used to bounce a bit so that if you ploughed up the middle of the drawing office you would upset half a dozen draughtsmen because their pencils would bounce all over the place. Things started to pick up in the preamble to getting work in Asia and the possibility of running computer systems. The head of the research department at the time George Klemmer ordered the first PDP8 computer. Actually we bought two from DEC and I think they cost something like 26,000 pounds each. They were in huge 6 foot cabinets and had a memory capacity of about 6K I think. They put it together and they made the first basic computer tote system where they could go around to the people like the Hong Kong Jockey Club and say we are looking at computerised multi pool type systems and at that stage I was elevated to Drawing Office Manager. I was controlling 27 draughtsmen and trying to update the systems that were there so that we could cover larger projects. The design and development of the J11 ticket machine was almost completed at that stage. The development of the computer tote in conjunction with IBM and Autotote was under way in the States. We were preparing for full manufacture of J11. The Drawing Office had a hierarchy of senior design draughtsmen who had very conservative views on things. They had been in the tote, mainly from boys, they had come up through the ranks as tradespersons of some sorts as toolmakers or machinists. They often designed to machinery and plant that we didn't have which in a way was a good thing because it forced the modernisation of the factory plant. They were hard to control. They were very anti anyone who was new particularly me and it took a long time for them to get around to having any respect for my management technique. In the long run it developed into the best of work associations. Like I said, the office was antique. We had systems of paper which were beyond belief. The mail came in and all mail had to be read by the general manager or his personal secretary who would then assign the mail to a typist who would type it on as many as 8 sheets of coloured paper using carbon and have it distributed to the people concerned and filed into the various archiving filing systems. At that stage we did not have any form of copying machine. The only copying machine we had as such was the wet type paper printing machine which was used to print the office drawings which they had only just acquired. Prior to that they used the blueprint system which used an ultra violet developing system and if it rained for a few days you did not get any drawings printed. There was a large pool of typists and they did the copy work. They also did all the normal things like short hand and looking after their assigned executive if they had one, or if they were a pool typist they worked around the various departments doing the clerical work. The print room was always a source of problems within the organisation, mainly because of machinery. The wet printing process was slow, the chemicals were obnoxious and the time from printing a drawing to the time you could actually use it depended on the weather from an hour to about four hours before you could pick it up, otherwise it would fall apart because it would be that wet. We developed a drying system for that, which was a big table with a double bed electric blanket under a sheet of Marviplate which was that plastic covered steel with which they make partitions and office furniture out of. We left that on at full bore and the papers came out and lay on this heated steel plate and they dried in a few minutes. It wasn't long before we were approached by some of the companies promoting the ammonia developing systems, the gas systems which we had all sorts of problems with, exhausting the gas to the outside world. We eventually got over that. As the machines improved we kept on replacing them until we got to the last machines which were canister operated and they drew their ammonia from a saturate of ammonia in water and they absorbed the gas into a charcoal canister. It worked very well and we could have it in an office and the smell was not noticeable. There was often up to 3 ladies who worked in the print room preparing drawings for draughtsmen for checking and for issuing to the factory for manufacture. There was a very strict control on drawing issue, there was a paperwork train called a callup system where a drawing was noted for release. If there was anything commented about it whether it was altered, revised or amended, this had to be in the callup sheet. Then the drawing control lady went around the factory and she had to recover without fail every drawing that had been issued to the shop floor and replace it with the upgraded or new drawing. We finally were allowed to buy a Xerox type copying machine. So with much ado we were sent off to the city, looked at all of the available machines at the time, there weren't many and it was decided we would buy a Rank Xerox 920 copier. I think it was capable of 15 A4 sheets per minute. It was installed in a room on its own and we added a print room operator, a lady who did nothing else but operate the Rank Xerox because of the complication of operation. One of the real problems with the machine was that it would stall and catch fire. But Rank Xerox had thought of that and they provided each machine with a small dry fire extinguisher which was clipped into a fast release clip on one side of the machine. We kept it going for quite a long time and finally there was a reasonable fire and the insurance assessors for the building said to management that the machine had to go, as they had several places burnt to the ground because the 920 had taken the place with it. They were replaced by several wet process machines. These copies were greasy and oily and rather yuk! Finally we got to work with the Cannon company and we had lease machines and each year the machines were replaced or upgraded. I can remember the days, when this print room which was all glass, could not be seen through because of the amount of smoke from caught paper being cooked in the fuser system. We also had a Photo Lab. There was a young lass who was trained to photograph everything. It was practice that each product or group of products that was being manufactured would be photographed and catalogued. There was tens of thousands of photographs of everything over the years. The same thing applies to 16mm film. We had a camera which at various times they took film of live events, opening of totes etcetera and there were also some professionally made 16mm promotion films. One of them I remember distinctly was a trip that one of the sales executives, Don Hardy I think, took to India. It traced the preparation for going to India, getting into a 50s model car and arriving at the airport and walking up the steps to a Super Constellation aircraft and flying off into the blue yonder. Then they showed the racetrack in Calcutta or somewhere like that and the sales executive walking around talking to the local people. Also in the photo lab area were the photo finish people who were involved with the on track day to day operation of the photo finish gear. If necessary they would make up new photo finish cameras and the developing and printing gear that made up an installation. The only one I remember them making up the whole track for was a dog track in Djakarta. The Drawing Office worked in collaboration with the Research and Development department. The developments that came out of there were taken to the drawing office and then production drawings and method engineering was applied to them before they went to production. Often what came out of research was more of an idea than a product. I remained in the Drawing Office until 1987 when I was made Manufacturing Manager for the whole organisation. Getting back to the building, it gave a fair amount of problems as it aged. In the front part of the building it got concrete distemper which was causing great lumps of the facades to sort of explode and drop off onto parked cars across the front. Some expensive remedial work was carried out. At this time we were starting to move more and more away from manufacturing and the use of our production machine shop dropped to about 10 percent of what it was. We subcontracted all of the sheet metal work, machining and fabricating work for the terminals which were being made at the time. Equipment was sold in an attempt to gain capitol. One day I received a letter from the State Government declaring the building a heritage building which meant that it could not be altered unless you had an order from the heritage council. This was due to the fact that the other two buildings done by Julius Poole and Gibson in the late 40s had both suddenly disappeared, the Lifesaver building and the Marrickville Margarine one at Mascot. The Meadowbank building was now the only standing evidence of this particular design. I was quite pleased because the building would remain in its original form. As it turns out, that is what has happened. Soon after ATL moved out, the building was sold for 3.7 Million to a company called Jtech in the ISDN technology mainly to do with government and defence high speed digital transfers. The factory has been modernised and painted and I have been passed it and it looks good. Note1 - I have also been past the old factory during a visit to Sydney to see Frank Matthews in March 1998 and I was also pleased with the result. Note2 - In the following section Neville comments on each photograph in a photo album. I have omitted some as they do not relate to the factory. The Meadowbank factory photograph at the start of this page, was taken circa 1950. Notice the 1948 Buick which belonged to Alf Boa. The picture is taken from where in 1975 they built the new toolroom. One of the things that was of interest was that in the central tower part where the flagpole was mounted, there was a total of four fairly substantial vaults which were used for the storage of confidential documentation and patents. In the operational days the cash was actually kept there overnight on Fridays and returned there before on course security systems were in place. Also there were vaults underneath. There were two large cellars into which were placed all of the documentation which was required by government statute, taxation and other reasons were stored. When I emptied that out, there was some 8 Tons of documentation dating back to 1917, with some notes of board meetings and discussions that took place long before the formation of Automatic Totalisators, when Julius was being financed by various other organisations for developing and installing the tote systems around the place. There was a flooding there at one stage and a great amount of the documentation was lost, particularly drawings of tote buildings on racetracks around Australia and the World. The drawings for the Meadowbank building were in another vault and were left in the building when we vacated it. This is a photograph of the foyer. Notice the Art Deco architecture and in the floor the ATL diamond. We always said that when the new ATL logo came out it was more like a tombstone than a logo. This logo is still used by the company that bought the toolroom. I recall sitting on a bench in this foyer in 1977 waiting apprehensively for a job interview with the Personnel Manager David Temple, whose office was directly on the left after entering the main doors, seen open at the left and right edges of the image above. My wife worked at the time as an Assistant Manager in the Commonwealth Employment Service office at Ryde. Through her work she knew of Automatic Totalisators Limited and the Personnel Manager. The company had a reputation within the area, that if your son managed to gain an apprenticeship with this company then he had "made it". I was in Sydney recently long after this factory was sold, after AWA took over the company in 1991. I went to see the old factory for a nostalgic look around after the turn of the century. Although all trace of Automatic Totalisators or ATL had gone one ember remained, the ATL diamond in the floor. After another long period, in January 2016 I communicated with Greg Davis. He had shared his Facebook Automatic Totalisators Limited Meadowbank Factory post, with the Old Sydney Album group, which I was looking through. The images in this post were of this factory building as it lay deserted ready for demolition. ATL vacated this factory decades earlier, with other companies having occupied it since. 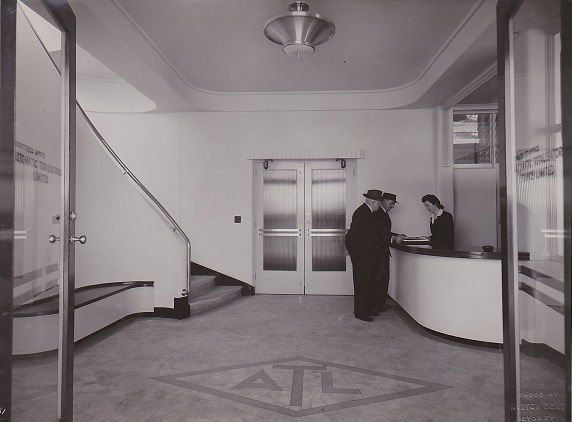 Greg made the following comment about the Meadowbank factory foyer shown in the image above: Such a shame a building as beautiful as ATL Meadowbank is being demolished, oh how I would love to keep the Terrazzo floor and curved staircase from the front foyer! I took these photos this morning. So sad to see such a iconic building being destroyed! Mostly the steel roofing has been removed and some gutting of the interior walls has already taken place. The entire south side of Nancarrow Avenue is now under redevelopment all of the newer buildings including the ATL Tool Room and all of the other factories and office blocks have been levelled. The Hoover factory site at the very top on Nancarrow Avenue is one huge excavation I suggest it will have 4 or more levels of underground parking, on top a very tall tower block. We drove down to the ferry Wharf and then driving to Meadowbank station using a new street which now passes through what was the TEI/Plessey/Marconi factory, now replaced with hundreds of units the site has a shopping centre including a Aldi store. I totaly agree with Neville it is like seeing an old domicile where many happy memories were made, being demolished. Even moreso a place where so much uniquely Australian industrial history was made with unbelievable global achievements. I equally lament the demolition of the old AWA factory at North Ryde from which so many Australian iconic technology achievements stemmed. I share Rod's emotion in his following comment. Rod Richards wrote the following after reading Neville's email: I must say that I had a tear in my eye just looking at the photos of the devastation of this once proud, iconic building and thinking of all that energy that went into the wonderful work that was achieved there. On a brighter note, in March 2019 I saw the ATL Diamond seen in the marble floor of the image above preserved and prominently displayed on a wall near the entrance of the new apartment block that now sits on a major part of this factory site, which has been named ATL House. I have added an image with some associated information relating to this to the George Julius Genealogy and other latterday interest chapter of this website under the heading A Visit to the Old ATL Meadowbank Factory Site . To read this, click on the Go to the index button in the Navigation Bar at the bottom of this page then select the chapter mentioned which appears in the Posthumously section of the index. Back to Neville's audio tape transcript: This is the main office showing the typing pool and the methods engineering guys. I only recognise one of them, a guy called Lance Wollie the second clerk on the right hand side. I believe that one of those girls is June Noble. This is a picture of the drawing office. When we wound up the place that is where the drawing office ended up again. Right back where it started in 1948. Interesting thing about the drawing office is that up until 1952 all the drawing was done in the city office by Julius Poole and Gibson. If you look at the left hand side of the picture the third draughtsman from the bottom of the page a guy in a light coloured shirt, that's Norm Noble. 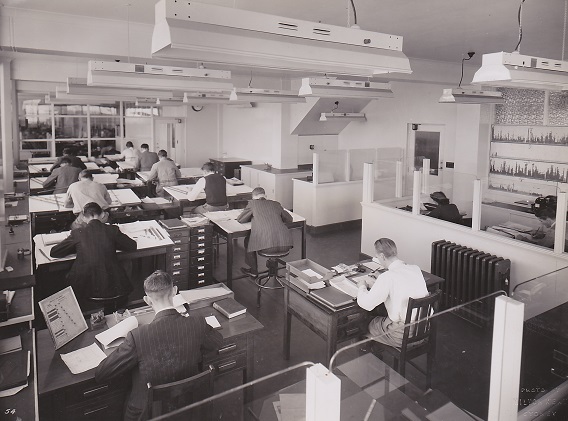 Note1 - The above photograph pre-dates my time and the drawing offices that I recall had the draughtsmen all standing, with their large angled drawing stations. I worked with Norman Noble for many years at ATL Meadowbank. Norman, wife June and son Ken had returned to Sydney after working for ATUSA in America, during the first turbulent years of ATL getting into the Totalisator industry there. ATUSA was a wholly owned division of ATL, set up in 1956 a group of Australian engineers went to USA to launch the business many difficult hurdles had to be overcome before the company became very successful. Norman left Newark when June felt unsafe there due to the racial problems prevalent at the time. The family moved in with Norman's mother in law Marina Dodwell at Bridge Road Strathfield. Nancy and I attended her funeral, Keith was not there but brother John the then Master Sydney Ports was. Norman began work back at ATL Meadowbank, for some never understood to me reason, Norman was relegated to menial tasks until he took over the management of the Turnstile sales and manufacturing division. Norman developed a market for ATL's turnstiles and event admission systems, at swimming centres, football stadiums including Melbourne's MCG arena. Most Australian Racecourses had ATL turnstiles, Norman was known as "Minister for Turnstiles" Norman knew everyone on the Sydney race tracks often manning the track's members entry greeting his many acquaintances, getting tips on the days racing from owners trainers & Racing writers. Politicians were also among his many friends. The turnstyle system above is complete with a Pram gate and Exit Turnstile. As manager of the design office, Norman always sold nonstandard admission systems requiring design and development. Every Turnstile installation was given all of Norman's zeal for customer service. We always got on well and I was his fall back when things went wrong in manufacture or at an installation site. Norman would storm into my office with one of his favourite sayings "We are in more strife than Speed Gordon", we would work together to sort out the problems. Norman and June bought a home in Bayview on Sydney's Palm Beach peninsula. Son Ken completed his education and joined the Federal Police. June remained at home supporting Norm, at times accompanying Norm on sales trips around the country. June is the sister of Keith Dodwell, long serving member of ATUSA, working for 61 years before he retired some years ago. Keith was President or Vice president managing the US totalisator systems nationwide, while developing advanced Pari-mutuel equipment. Norm fell ill and during a biopsy had a severe stroke from which he never recovered he suffered for many months in a hospice before he passed away. Over the years since, I would have a telephone chat with June. She missed Norman and his zest for life. June developed a memory problem so we were no longer able to communicate. I often think of Norman, he was a great friend, a gentleman and always a pleasure to work and socialise with. I was just thinking over the many Turnstile and Admission systems I worked on with Norman. Sydney Tower, Monorail, Expo 88, Black Mountain Tower, MCG, Sydney Football stadium, every Racecourse in the Eastern States, umpteen swimming centres, City Rail, Bruce Stadium, just to name a few. Webmaster's addition: I too recall Norm very well, he was also one of the people mentioned at the top of this page, who would do anything to support operations. Despite the fact that this was not his responsibility, he would often work weekends or out of hours to send urgently required parts, when the people who were providing support for operations were not contactable. This in fact was an essential service as racetrack operations usually operate out of business hours, on week ends and public holidays. He and Neville Mitchell certainly made my life easier on many occasions when I was in desperate need of parts to confidently run the next race meeting. I attended a sales presentation Norm gave at Lang Park in Brisbane. It created a lifelong memory as I have not seen a more polished sales presentation prior or since. Norm was one of those people that made you feel good just being in his presence. I still hear his words resounding in my ears which he used to liltingly utter when you were saying something he fervently agreed with "I KNOW, I KNOW". I miss him! What the world needs is more Norms! I have more memories of Norm that were not directly associated with the Turnstiles. Norman was on occasion assigned the task of attending progress meetings of the various projects that were afoot in the Sydney area.His main purpose was to take the minutes of the meetings for ATL's reference. Norman was a prolific writer, he would record all conversations, including the demeanour of the speakers. As a topic or issue was discussed Norman would record, A The issue B The solution C The Action D The person or company to respond. The accuracy of these minutes often caused embarrassment at further meetings when Norman could recite from his minutes every word or promise undertaken that was unmet. Norman's notes in the margins were revealing he would write "The guy full of BS" - "I saw the look on his face no confidence" - So And So is yawning! His ability to determine the trustworthiness of people around him served Norman and ATL very well. The typing pool (Webmaster's addition: Shown in the second image above) detested Norm's Minutes often amounting to tens of pages. Two projects that I had Norm as minute taker were Wentworth Park and the QE2 Royal Randwick Grandstand upgrade. Both jobs turned out very well some of the success was because how Norman's minutes held others to their stated intentions. Nev Mitchell should be made the "Application Engineer" for both ATL and Gladstone. Nev is one of the most knowledgeable & versatile engineers in ATL. He is one of the most co-operative people on the staff & I have never asked him for a job that he has not been able to do with a minimum of fuss, he is cost conscious & he realizes both installation & maintenance problems. He has helped with a turnstile problem at Wentworthville Pool & the pool manager said he went about the job very professionally. This was on a Sunday, so the manager feels that Nev is an extremely conscientious person who was a wonderful rep for the company. Working under Alf L<!-Lesins>... is a trying job for Nev because Alf cannot see the merit in changing priorities like Nev can. Greg Hill who met Nev for several minutes one day was extremely impressed with his knowledge of the latest market products as was Joe Webb. Nev Is not a "con man" yet he can get people to do rush jobs for him because of his nature & approach. He is aware of who is worthwhile in the company for all types of jobs & he is constantly trying to keep work flowing to the various sections when he notices they are short of work. His value to Gladstone would be enormous & because of this he will tend to keep the "experts" in line, because at the moment they tend to feel they are indispensable. When Norm was put in charge of the Turnstyle Department he turned it from a company legacy product side show, into a booming business. I recall still seeing Norm's turnstiles in the field up till my retirement over three decades after his. 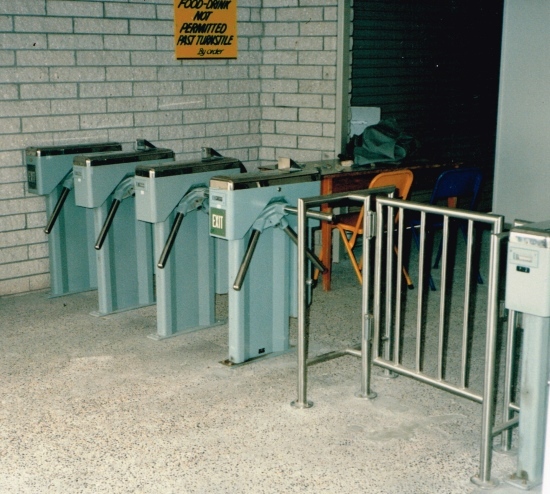 Thanks to Norm's son Kenneth, for providing this image of what will probably be Norm's most enduring turnstile of all, although at the time of my retirement, the turnstiles I recall appeared indestructible even after decades of service. Thanks to Neville Mitchell who recorded the above information and supplied the photographs. Thanks to Frank Matthews, last senior partner of Julius Poole and Gibson, for the photo of the valve/semiconductor comparison. 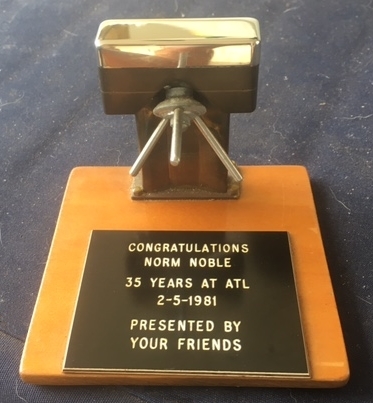 Thanks to Kenneth Noble for providing the image of Norm's service memento. The photographs in this page were taken by Milton Kent and Son in Sydney, commissioned by Automatic Totalisators. Thanks to Ian my 11 year old son (1997) who was a great help with the typing, the html and the images.